Example using a tablet for house party or Media Station i want to hide the buttons on the screen and the bar on top too ? Just waiting for new first beta where new interface will be implement. Hi Andrew, I want to do exactly the same thin (on Android 6) ie Settings > Look and Feel > Status Bar/Notification > Hide Status Bar -- However there does not seem to be a "Hide Status Bar" in Android 6? Am I correct or I may be missing something? 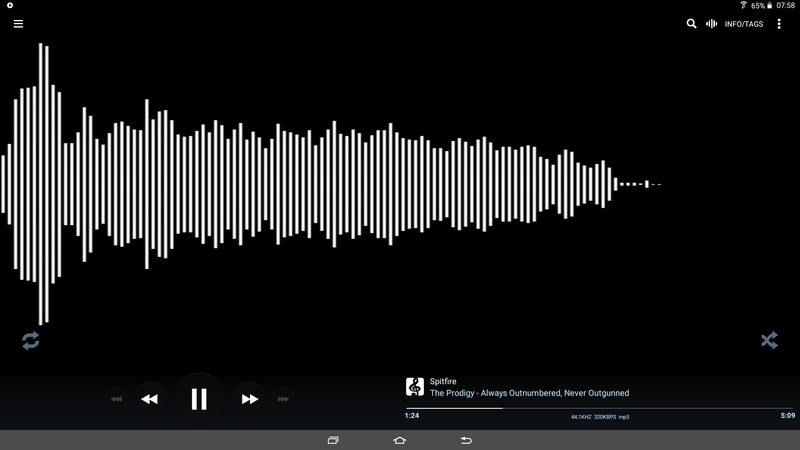 I have always done this (Settings > Look and Feel > Status Bar/Notification > Hide Status Bar ) using Poweramp on my android 4.2.2. Ther does not seem to be this same feature now on Android 6. I hope I am not right in thinking this!! Please help.. the Status bar in Android 6 is too big (in my opinion) and disturbs the nice look of the app!! I want to be able to hide this.. How do I do this on Poweramp (in Android 6). I also have PlayerPro...and it allows you to hid the staus bar. Not currently an option in Android 5+ on tablet layouts, although it is for phones. The whole user interface is being completely rebuilt for the next beta release anyway, so this will most likely become a moot point by then. Looking forward to it! It would be great if more care would be given to landscape mode and the organization of items on the screen. While portrait mode looks worderfull and the screen is optimally used, in landscape mode on a tablet (in my case - Android Car Navi) lots of space on the screen is waisted, and the most crucial items (next/prev buttons, seek bar, song title, etc) are small and difficult to handle, while half of the screen to the left and right of the album photo is empty. Its nowhere near ergonomic (except swipe left/right and up/down gestures which are great). And it doesn't look good in any way. Could there be a few options for landscape mode made available? Or this will be done by themes, when they become available again in a beta/final release? That being said, I must admit that the audio quality and the speed of the app, which, in the end, are most crucial, are absolutely to the galaxy! Best sounding app on Android I have ever tried. Now 24bit FLACs sound like studio recordings, as they should, and not like MP3, like in any other app I've tried. Great job! Yes, in my case too! This is, on double din Car Satnav Stereo running android 6. Exactly my point too. It's a great app, but I hate the fact that you can't get rid of the top (status bar). And some skins even make the waste of space you mentioned even worse!! Yes, in my case too [ just as ttoton said! ] This is, on double din Car Satnav Stereo running android 6. Exactly my point too. It's a great app, but I hate the fact that you can't get rid of the top (status bar). And some skins even make the waste of space you mentioned even worse! !